Depeche Mode have written many great songs that have stood the test of time. 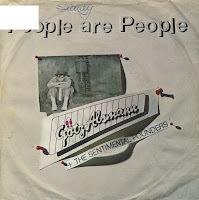 One of them is 'People are people' (1984). Having heard the original countless times, sometimes I get curious how other bands would perform this track. My curiosity was finally satisfied when I found this single by Götz Alsmann and the sentimental pounders. Contrary to Depeche Mode, this band worked entirely with acoustic instruments to create a very 'cosy' version of the song. It always makes me happy when I hear this version.